I had an amazing exchange on Twitter this week. A Gundam fan told me he’d always been interested in Gunpla, but didn’t know where to begin. We chatted a bit and he ended up choosing not one, but two models to get started with. It reminded me why I started Gunpla 101 in the first place. For somebody like me who does most of my work on a computer, it feels extremely rewarding to build something with my hands. It doesn’t matter if there are some flaws, the process is what makes it fun. Now it’s easier to get into Gunpla than ever. Bandai has spent a lot of time reviving older models and refining their molding process, so Gunpla fit together more easily than ever. If your 2017 New Year’s resolution is to build your first Gunpla, you’ve got lots to choose from. The Gyan first appeared on screen in 1979’s Mobile Suit Gundam as an enemy mobile suit, but today its “knight in shining armor” design transcends definitions of good or evil. 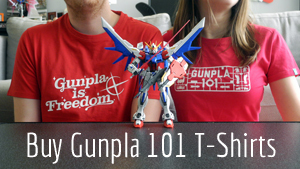 This now classic model is an attractive and functional first Gunpla pick for a beginner. Gyan is part of the Revive line that Bandai released in 2015 to celebrate Gundam’s 35th anniversary. So even though Gyan is an old mobile suit design, it’s one of the most modern, articulate, and refined kits you can get today. Another 2016 release from the Revive line. The Gouf is already iconic, and Bandai’s latest color separation technology means its distinct blue is a richer hue than ever. Another reason Revive models are good for beginners aside from their improved construction: they’re just smaller. Over the years, you’ll notice that 1/144 Gunpla kits from newer shows are getting bigger and bigger, culminating in the massive Unicorn Gundam. That’s because in the show, Gundams are designed as larger in proportion to humans than they used to be. Smaller kits mean shorter build times and fewer parts that make them less overwhelming. Looking more like a pretty pink teddy bear than a mobile weapon, Beargguy is an eclectic pick for a beginner who is interested in seeing the sheer range that Gunpla kits can cover. This beginner may have already known kits could be cool and deadly looking, but they may not have known that Gunpla could also be silly or cute. Beargguy is a simple build with plenty of heft to show for its short construction time. Better yet, the show it comes from, Gundam Build Fighters Try, is a great “gateway” Gundam show. Released in 2015, it’s fast-paced and made according to modern animation standards, which might make it an easier sell if you’re trying to convince a friend to finally get into Gundam. Beargguy is a 30 minute build, tops. Petit Beargguys, like Pandagguy, barely take 15 minutes. These tiny kits are cute and as easy as Gunpla building gets. And while there are so many colors and styles to choose from, the Pandagguy uses stickers and a three-color scheme to appear more visually complex than it is. If you have or know a child who has reached an age where you can trust them with tools like Gunpla nippers, I would recommend this as a kid’s first kit. It will show them the fundamental skills required for much more complex kits, but without the lengthy time investment. On that same note, it’s a great kit for anyone who has a short attention span! There’s nothing more iconic than Amuro’s original Gundam from Mobile Suit Gundam, the RX-78-2. Now it’s easier to build than ever with the RX-78-2 SD EX-Standard. The EX-Standard is a sub-line of the SD (super deformed) scale of cute, cartoony versions of mobile suits. It certainly isn’t true to life, but it’s instantly recognizable and a quick, simple build. Gunpla 101 contributor Mario Lebel reviewed this exact kit in 2016, praising its flexibility and straightforward construction. Check it out. Stick with new models and new shows. You may love 08th MS Team, but there haven’t been any new kits from that show in years. That means they’re older and harder to build than models that came out this year or the last. High Grade and SD are your best bet. For a crash course on grade and scale, click here. Use the right tools. Gunpla may seem simpler at first without a pair of side-cutters, but as you delve into more complex kits, you’ll be glad you learned to use them. Most importantly, pick a model you love. If you’re trying to choose between a kit that looks easier to build and a kit that is really meaningful to you, pick the latter. Here’s to a productive year of Gunpla! Happy building!